I remember the first time we tasted polenta. Margaret Falcinella stirred up a giant kettle for a family affair. We were not blood family so had no idea what we were digging into: polenta topped with sausages and marinara sauce. It was so good I wanted to lick the plate. Everyone must have felt the same way because the giant kettle was scraped clean. Polenta is a cooked coarse-grind corn meal, economical and easy to prepare. It is a wonderful way to add variety to your menus. Little ones gobble it and older ones regard it as gourmet. 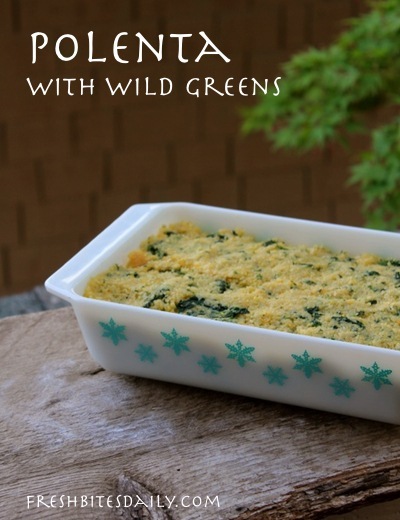 Here is a way to enjoy polenta while including more greens in your diet. Use soup stock in place of the traditional water for cooking. All told, you end up a really nutritious dish. The recipe is inspired by a recipe in Greens, Glorious Greens, with a little adaptation to fit our own palates. Polenta can be served right from the kettle as you would mashed potatoes. You can top it with cheese or a sauce. Serve with meat or not. If you have leftovers, press the polenta into an oiled loaf pan, cover, and refrigerate (as is pictured here). To serve it a second time, slice the polenta in 1 inch thick slices. Fry in olive oil until it is crusty on both sides. Some consider this second round as the better of the two. You decide for yourself. Bring the stock to a boil in large saucepan. Slowly add the polenta, stirring the whole time. Turn the heat to simmer and continue to stir every few moments. Standard polenta will take 20-30 minutes to cook. Instant polenta is much quicker. Read the directions on the package. While the polenta is cooking, saute the garlic in butter and add the minced tomatoes. Add the contents of the saute pan to the cooking polenta. Scrape all the butter from the pan. It’s brimming with flavor. Just before you take the cooked polenta from the stove, add the minced green. Stir in the greens and continue stirring for a minute or two. Stir in the grated Romano cheese. Taste for salt and pepper and make adjustment. We especially enjoyed this polenta fried in squares and topped with grated Mozzarella. Italian sausages and a green salad finished the plate. It is memorable and pretty quick. 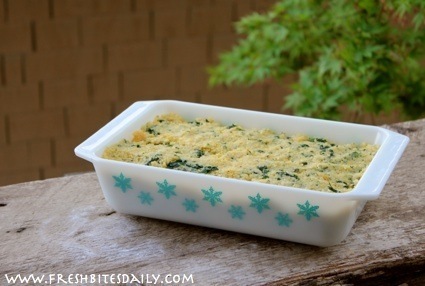 3 Comments on "An extra-nutritious polenta with some added wild greens"
Mmm that looks and sounds great! I have never had polenta, but from the description it is something I will be trying soon. Thanks for the recipe! This really looks great! I think polenta greens could be a best meal anytime of the day, but much better to serve during breakfast. I will try your recipe for sure.